Yesterday my 2017 SeaWheeze shorts arrived via FedEx. They were shipped on Thursday and were in Calgary at 643pm on Friday but because of the weekend, I had to wait until Monday to get them. First world problems, I know right? 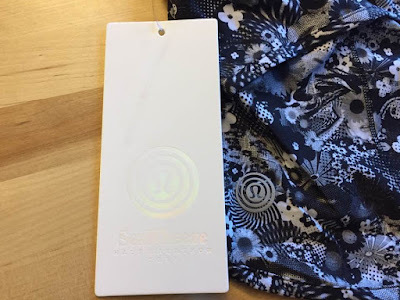 If you are not familiar with SeaWheeze shorts, Lululemon puts on a race every August in Vancouver and with the race entry fee, you get a pair of either speed shorts or tracker shorts. I am not sure what the boy versions are called. They typically arrive the end of April, beginning of May so you can start your training although for people like me, the training never stops hahaha. 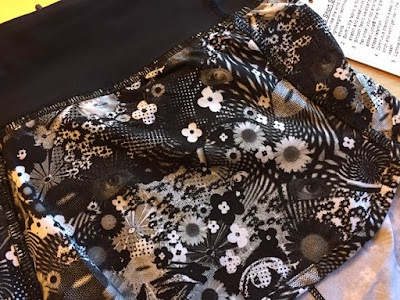 And since they arrived, I thought I would take a trip down memory lane talking about the shorts I have received over the years. I always select Speed Shorts because they are my absolute favourite and I probably have 20 pairs. Well maybe not 20 but definitely more then 10. I also size up with speeds otherwise I get a wedgie when I run and that is not fun. 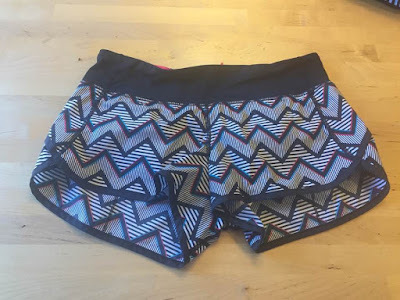 I have never ever loved my SeaWheeze entry shorts. When I get them, I always ask myself if I would have purchased them on my own and I probably would have bought my first pair and probably my second. I never ever would have bought the ones from last year, I still don't like those and the jury is out on this years. These were the first pair I received in 2014. I love the chevron pattern and the stripes too but I don't love the blue and red lines in them. That is why I may or may not have bought these. Greg ran this race with me and his shorts are way more awesome - they are similar to the liner in these shorts which are posted below. I wish our shorts would have looked like the liner or his shorts. Both pairs came with 3D glasses because these shorts are 3D but I don't have those anymore and really why do you need 3D shorts. The reason they did it though because the theme was optical illusion and the special SeaWheeze logo that year was an eye ball and so cool. You can kinda see it in the liner below. 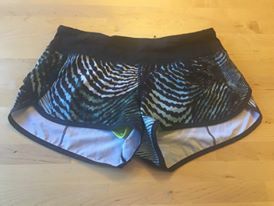 These shorts came for my second SeaWheeze and the theme that year was science. I don't remember the exact name but it was especially science. I like these shorts the most as does Greg. I only know this because he asked me why I had them all pulled out on the kitchen table and then gave his opinion. I like how bold these ones are and you can essentially wear any CRB that you own and it will work. 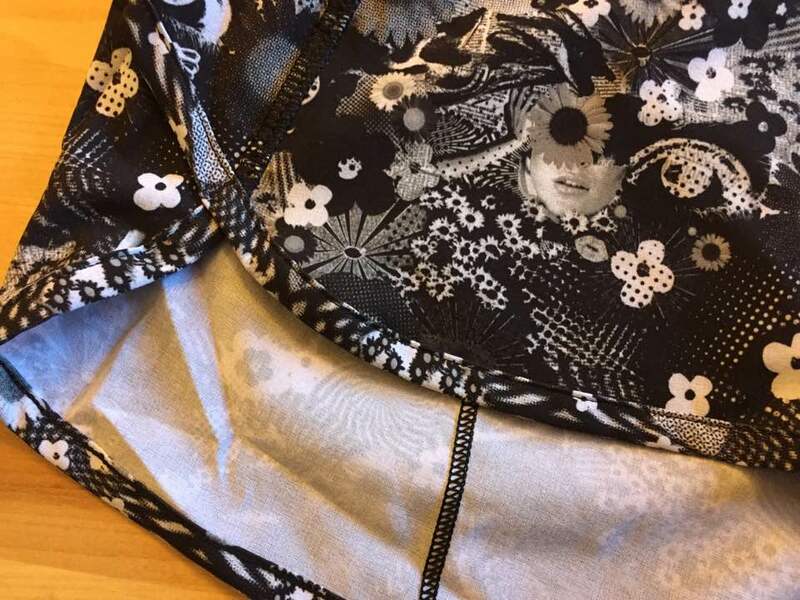 The liner on these are just beige and super boring but I do like the print and most likely I would have bought these ones. In fact, I am 100% certain I would have. In 2016, these were the shorts. The theme was Dr Who I think. Is he a spy?? It was a spy theme I know that and for some reason I am thinking Dr Who. I hated these shorts from the moment I saw the sneak preview on snap chat. And I wasn't wrong when I got them soon after. I hate blue and I don't much like the green in them either. And I wasn't keen on the print either. The liner, which is kinda peeking out at the bottom on the left, was a sick neon-ish colour that I really liked although would never wear. I would definitely never buy these shorts given the opportunity. 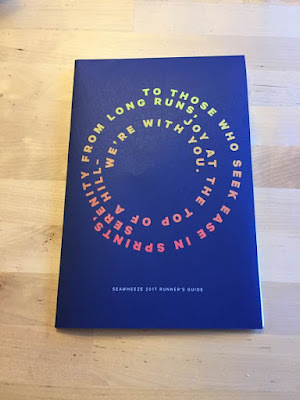 And now onto the 2017 SeaWheeze Shorts!! I walked the girls to school this morning and when I returned home from that, this pretty red package was waiting for me between my doors. I excited to receive them even if I thought i might not like them. So there was no sneak peek this year at the shorts. 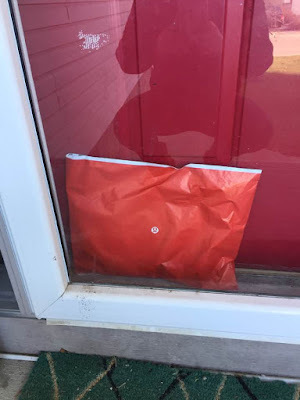 I was excited by this especially since mine were shipping so quickly. I was sure I was going to be able to hold out until my shorts arrived on Monday to see them. However, many people got there shorts on Friday and posted on social media. My friend Heather texted me Friday morning saying she had peeked and saw them. Apparently if you searched the hashtag seawheeze2017 they would show up. She was excited with what she saw. I asked her if they were yay or nay. She replied back with "They aren't pink so you won't love them but they aren't blue so you won't hate them hahaha". This was such an accurate response from someone who knows my colour preferences. She said she thought they were cute. I then texted my best friend Michelle and told her you could sneak a peek online and she went and did it. She was unsure if she liked them or not. I was at Telus Spark with Penelope's class and I thought that would be a distraction for me to not peek but it was not. 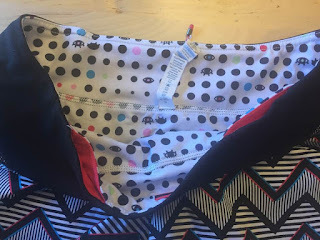 Truth be told, I didn't love what I saw on social media when I went searching for them but I was excited that I loved speeds and not trackers because I really appreciated the black band around the waist that the trackers lacked. However, much to my surprise, I loved them when I opened up my pretty red package. The pattern is called counter culture which was a prominent theme in the 70s which we were all pretty confident was the theme after a few hints and the volkswagon van all painted up at the sunset festival last year. While I am not a huge fan of flowers but understand why they are there, I love the eye balls and portions of the face you can see. This was not evident on the sneak peek on instagram on Friday. 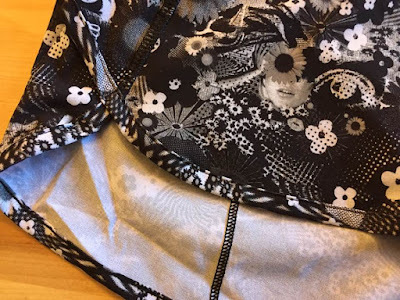 I also liked the little zipper pull they have on the back of the speeds now, so much better then what they used to have. I am also loving this year's logo too. Simple and sleek. I wonder if that will be the medal as that is what they did last year but would they really do that 2 years in a row?? I am excited to see that come race day. While pink is my most favourite colour, my second favourite would be black. 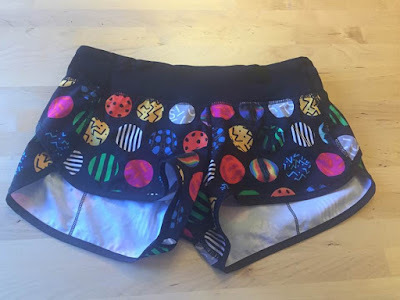 I think I would most likely buy these in the store but I don't think they can topple the bug shorts from first in my seawheeze heart. They also sent us this runner's guide that opens up into a giant training program. This year's program is mind body comprehensive and focuses on running, body, mediation, yoga and all that fun stuff. They also teamed up with MOVR which is a training app found in the Apple App Store. I was able to download it but so far it has not let me sign up for it. Probably overloaded with 10,000 + seawheezers haha. 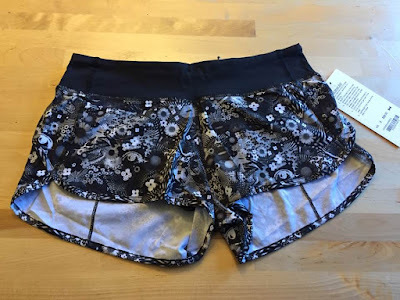 I don't follow the training program that Lululemon supplies us with as I run year round and have a half marathon before this one that i need to train for too but it is really good if you are a first time half marathoner which many sea wheezers are. 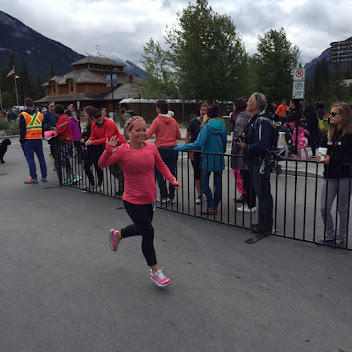 It was my first half marathon back in 2014 and this year it will be my 10th! What do you guys think about this years shorts? Which ones have been your favourite and your least favourite? ?